Rimfire Rifle Benchrest Matches – Montgomery County Fish & Game Club, Inc.
All classes shoot at a distance of 50 yards. [Semi auto] – Semi auto rifles with the only restrictions being no barrel tuner “Rimfire”, or one piece rest. Rifle can not be held down to the rest. In Centerfire matches rifles will be shot from sand bags or bi pods .Entry fee is $10. [Factory Sporter] – Bolt action rifles with barrels measuring less than .750 in diameter. Rifles must be in factory stock, have factory barrel, and have no action work done to them. Bedding the stock as well as trigger work or changing the trigger is allowed. No barrel tuners “Rimfire” or one piece rest. Rifles can not be held down to the rest. In Centerfire matches the Sporter rifles will be shot from Sand bags or bi-pods. Entry fee $10. [Target barrel or Heavy barrel]- Bolt action rifles with Bull type barrels of .750 or more . Rifles must be in the factory stock, and have the factory barrel and no action work done. Bedding the stock, as well as trigger work or changing the trigger is allowed. Rifles not included heavy bolt are (40X, Winchester 52’s, anschutz built in 54 action, Suhl, Cooper) No barrel tuners or one piece rest. Rifles can not be held down to the rest. In Centerfire matches rifles will be shot from sand bags or bi pods . Entry fee $10. [Unlimited] – Any bolt or semi auto rifle with any equipment. No restrictions. Barrel tuners and one piece rests are allowed. Unlimited is the only class in which rifles are allowed to be physically attached to the rest. Entry fee $10. New this year is Open sighted rifles. MCFGC has a very nice range and we plan on keeping it that way. All trash needs to be thrown in the garbage and there is no smoking under the shed where we shoot. No leaning on benches. The range is an OPEN BOLT range. Which means any rifle out of a case must have the bolt removed and mag out of it and if it’s a semi auto, the bolt must be locked back with the mag removed. Please bring chamber flags they are recommended. Before we begin there will be a safety brief from the RSO then we will get underway. You will have a 5 minute period to load magazines and get settled in. Once everyone is ready you will be given the order to insert your magazines and bolts. Once the order to commence fire is given you will have 20 minutes to complete your scoring target. After every one is done or the 20 minutes is up, you will have to clear your rifle and step away from the bench as people go down range to hang another target. Once you have shot your target you need to pick your stuff up off the bench and let the other people for the following relays start setting up. 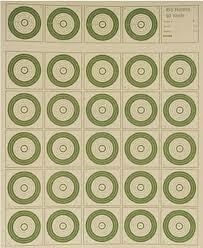 [Scoring] The picture is of the targets that we shoot at the matches. Each person will shoot 1 target . There are 4 sighters at the top of the target. You can shoot those as many times as you like and also at any point during the 20 minutes time limit. There are 25 scoring targets below the sighters. Each of those must be shot only once. If you shoot a target twice, then it’s a zero. If you leave any blank then it’s a zero. The score amount is written on the rings so you can see the what each ring is worth. The dot in the middle is the “X”. There is a max score possible of 250, and a max X count of 25. If you score the same as somebody else then the X count determines the better score. We score by “best edge” meaning if any part of the hole touches the line, you get credit for it. A scoring reticle will be used to see close calls. volunteer referees will be chosen at the beginning of the match and after your target is scored and hung up on the board for you to see, You will then have 10 minutes to protest any score on your target that you think is scored wrong. At that time the refs will make the final call on what the score is. That is the END of discussion after they make their call. Just remember we do this to have fun, and we always do. We pick and poke at each other in good humor. Don’t take anything to heart. ANY bad behavior, unsafe actions, drinking, or physical alterations will immediately get you asked to leave. You will only be asked once. If you don’t leave voluntarily, you WILL be made to leave. And please watch your Language! I look forward to seeing you there! !